Unlike other paint manufactures Tekaloid did not provide an exhaustive list of available colours but they did supply a colour chart consisting of 64 colours, including some British Standard BS-381c colours. Tekaloid colour cards are no longer available or required because almost any paint colour (including certain metallics) can be mixed or matched using sophisticated modern paint mixing methods, which gives the customer literally thousands of colours to choose from as opposed to just 64 colours from the original Tekaloid card. Tekaloid is only available in the United Kingdom and can be mixed and purchased in many different colours from the Avenue Group or Breakwells paints. The Avenue Group can supply Tekaloid in Europe (shipping costs extra). The modern mix of Tekaloid enamels are no longer Linseed oil but Alkyd, Alkyd is now a widely used tough synthetic resin which is slightly less pliable than Linseed but far more durable. Tekaloid Polyurethane has become less and less available since the introduction of Alkyd resins. Tekaloid's Tractol was formulated for agricultural machinery and agricultural vehicles, like tractors, hence the name. Tekaloid enamel is a finer ground pigment which has been through the mill more than once to produce a very fine pigment so the paint is easer to apply and flows out nicely, specifically formulated for coach work. Tractol dries faster is slightly more brittle and dries with a lesser shine than Tekaloid. The following colours match British Standards. 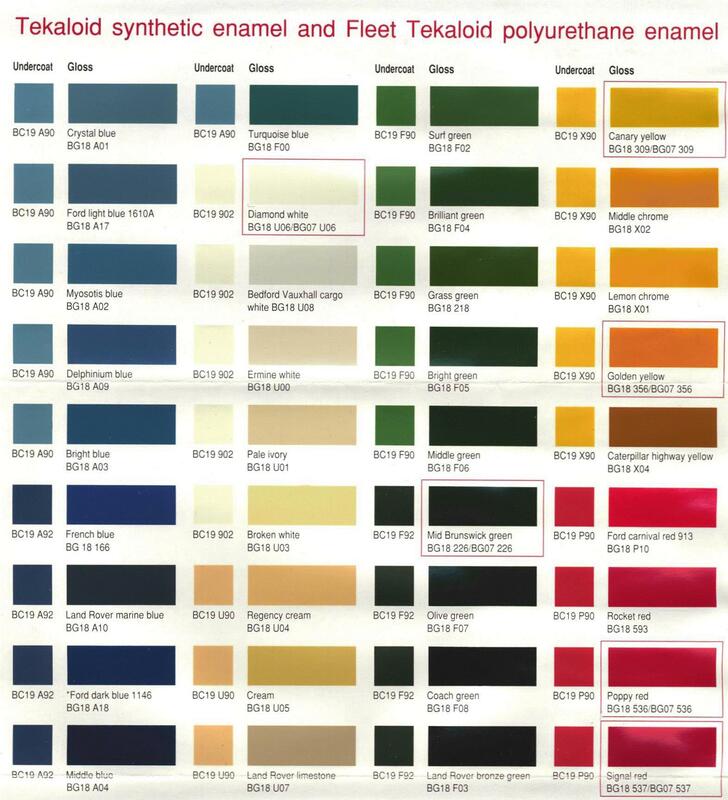 A few Land Rover colours are also supported, the following list of six being the most popular. Note: The following Tekaloid colours varnishing is (was) recommended to ensure maximum gloss retention. Varnishing is not necessary with the Alkyd resin now used in Tekaloid enamel. Instead of varnishing over the colours above to enhance gloss retention, varnish can be added to the paint directly, 10%, 25% or even 50% is quite acceptable. There are two types of varnish available, Pale and extra pale, the latter being more clear. Touch dry describes an almost dry surface and testing is done by using the back of your fingers, the back of your fingers are more sensitive to "touch" and are less likely to damage the paint surface as opposed to using your fingertips.